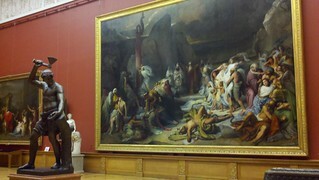 ST. PETERSBURG – My university host said he preferred the Russian Museum to the Hermitage because it featured Russian art. It was a simple statement. He was clearly proud of his country’s artists. Thanks to my father, I have seen a fantastic Van Gough exhibit at the Los Angeles Museum of Modern Art. My husband and I saw the Mona Lisa and other European treasures inside the Louvre. We also saw Michaelangelo’s epic David in Florence. But I have never seen a major display of Russian artistic works. Out of respect to the country and due to my own curiosity, I chose the State Russian Museum over the Hermitage as my first museum visit in St. Petersburg. And of course, Louie tagged along. 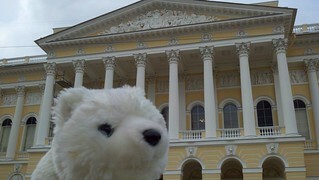 The Mariinsky Theatre is an epic stage for my Russian ballet experience. It’s more than 200 years old. Here – Tchaikovsky debuted his Sleeping Beauty. 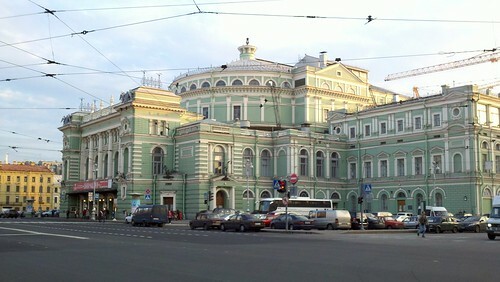 Prokofiev presented his “Romeo and Juliet” ballet here as well. Naturally, I got giddy walking in the footsteps of classic music giants. This is from last night: orchestra tuning up for Khachaturian’s Spartacus.